The third in my series of 54mm figures inspired by Robert Marrion’s illustrations is another figure from the 3rd County of London Sharpshooters. Featuring on the front cover alongside my first figure (the trumpeter), the officer wears Camp Church Parade Order as seen circa 1905. The figures which I managed to source on eBay sadly were without the sword which appears in the RJ Marrion illustration. 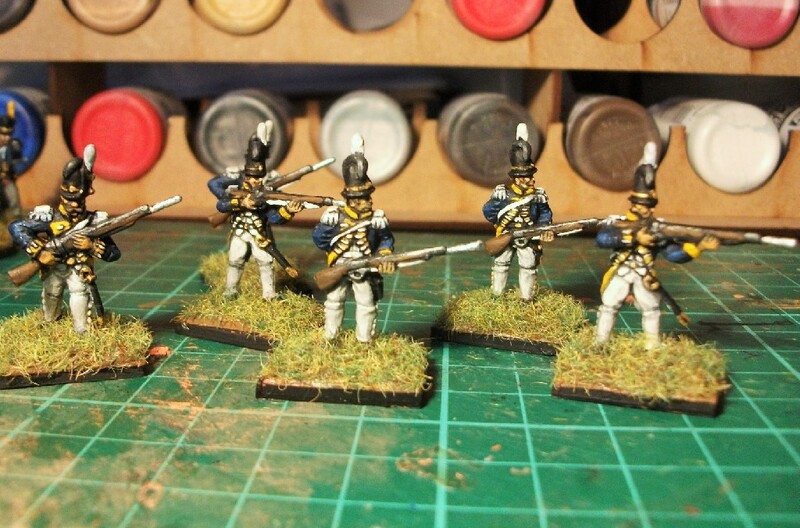 No matter as I sourced a couple of 54mm scale swords for my men to lean on. They came in their scabbards and so I had to slice off the rings. I had to also cut off the end off to shorten the sword into a size which would fit between his hands and the ground. There are two figures and I’ve based them both. One of them is still awaiting an engraved plaque to place at the front. 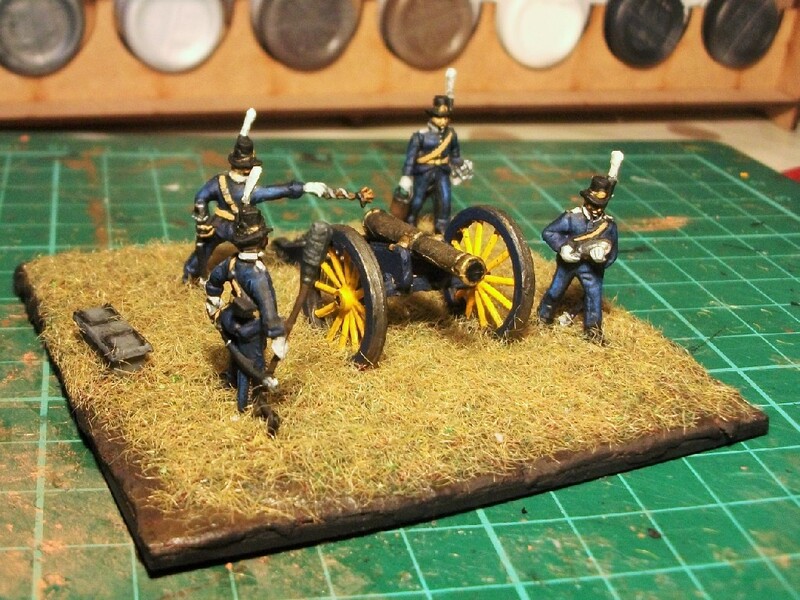 I’d like to introduce the third figure in my series of R.J. Marrion-inspired 54mm yeomanry figures. It’s another figure that appears on the front cover of the “3rd County of London Yeomanry (Sharpshooters)” book which was wonderfully illustrated by the late Robert Marrion. I should say that these are ‘figures’ plural as there are two of them, these identical twins coming as a pair in a single purchase from eBay. My figures appear in a much lighter shade of green under the camera lens, appearing a little more akin to the illustration to the naked eye. A group of Sharpshooter officers c.1904, a number of whom are wearing the same green uniform and forage caps with yellow piping and metal shoulder scales. Others are wearing a khaki serge coat. “For Camp Church Parade Order, the officers wore the green forage cap, the green serge frock, Full Dress overalls, brown leather wrist gloves and the Sam Browne belt (as seen on the front cover). The Robert Marrion illustration shows the officer resting his hands on the pommel of his sword, which is out of its scabbard. Initially, I thought that the sculptor no doubt faithfully recreated this sword but, unfortunately, as both my figures are missing this item, they must have got lost. One thing I’ve noticed, however, is that in the illustration the officer’s hands come up to the top of his belt. On the figure, however, the hands come to rest quite a bit lower meaning that the sword will have to be trimmed significantly short. So, I then mused that perhaps there was no sword, but then the empty scabbard suggests otherwise. An oversight on the part of the otherwise impressively talented sculptor, perhaps? Despite resting their hands upon air, the figure still looks convincingly as though the officer is merely folding his hands, in my opinion. 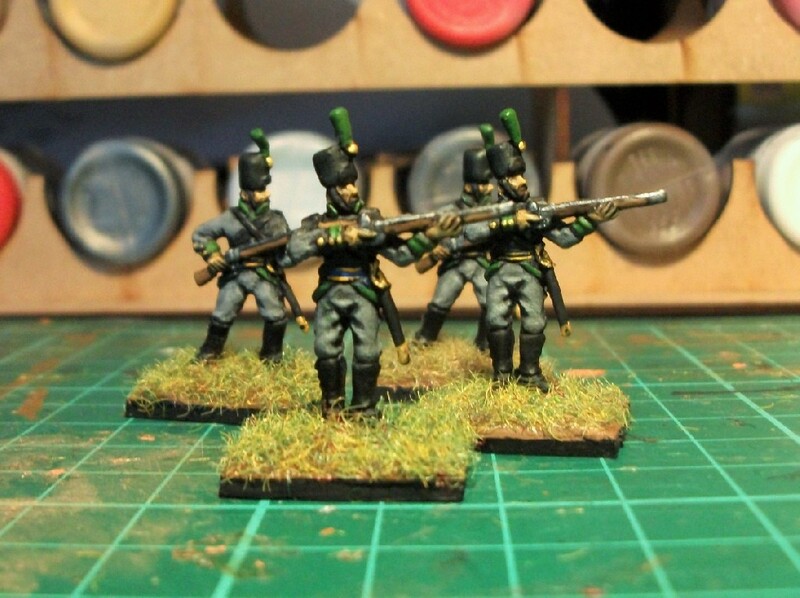 But I’m going to go with the sword to match the illustration and I have secured a 54mm scale alternative for their “Infantry Pattern” sword which, with a little trimming, I hope might act as a substitute. You will notice that this officer of the Sharpshooters is a decorated soldier. On his chest, Marrion has depicted two medals. From the book cover, I could see that one is clearly a Queen’s South Africa Medal with bars, suggesting that he served in the Anglo-Boer War as part of the regiment’s initial incarnation as the 18th, 21st and 23rd Battalions of the Imperial Yeomanry. On 23 July 1901, the 3rd County of London Imperial Yeomanry (Sharpshooters) was formed from the veterans of these Boer War Imperial Yeomanry battalions. After a little research, the other medal on my figures’ chest I now believe to be the King Edward VII Coronation Medal, a slightly oval-shaped medal awarded in 1902 to celebrate said monarch’s coronation with Queen Alexandra. It was awarded to “...service officers who were present at the coronation ceremony, performed extra work in its preparation, or who were involved in the coronation parade.” Interestingly, the date of the coronation which was printed on all the medals – 28th June 1902 – is incorrect. The king had to postpone the coronation until October when he’d recovered from an emergency operation for appendicitis. Sharpshooter officer wearing his QSA and King Edward VII Coronation Medals. 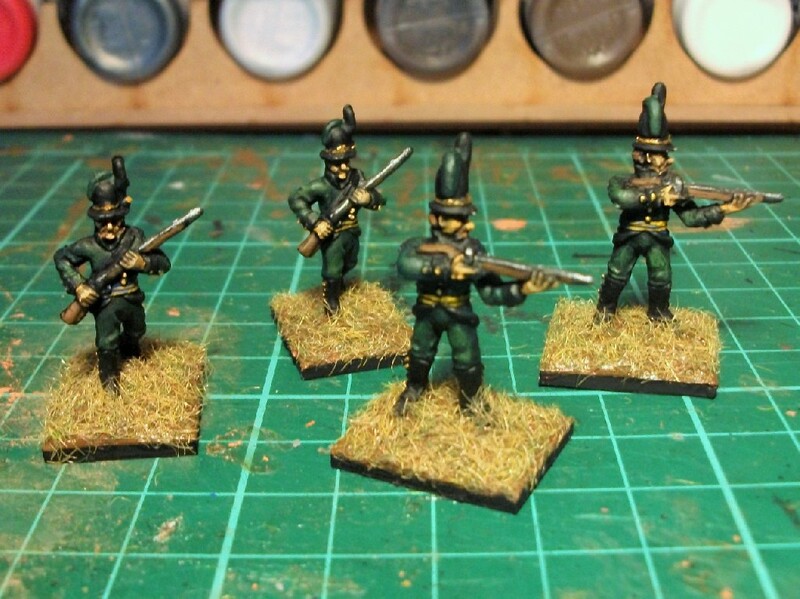 With the exception of my original Sharpshooting Trumpeter, the remaining figures have all come from a lady who is selling off her father’s impressive collection of figures. I politely enquired after the missing swords for these figures and through the post a week later, completely unexpectedly, was a wonderful handmade card from the gentleman’s widow. Wonderful padded fabric card of a Guardsman musician, handmade by a very kind lady who is the widow of a model soldier collector. It was a very generous act indeed by the lady. It’s a sad and sobering activity to observe; the selling off of a husband and father’s old model soldiers. As the army dissipates, it’s old commander having passed away, it is a vision of the (hopefully still very distant) future, when my own stock gets dispersed by my own spouse and daughter in a similar manner, hopefully to another grateful collector. Ah, but enough of such maudlin musings. Many a soldier I plan to add to Suburban Militarism’s army yet! 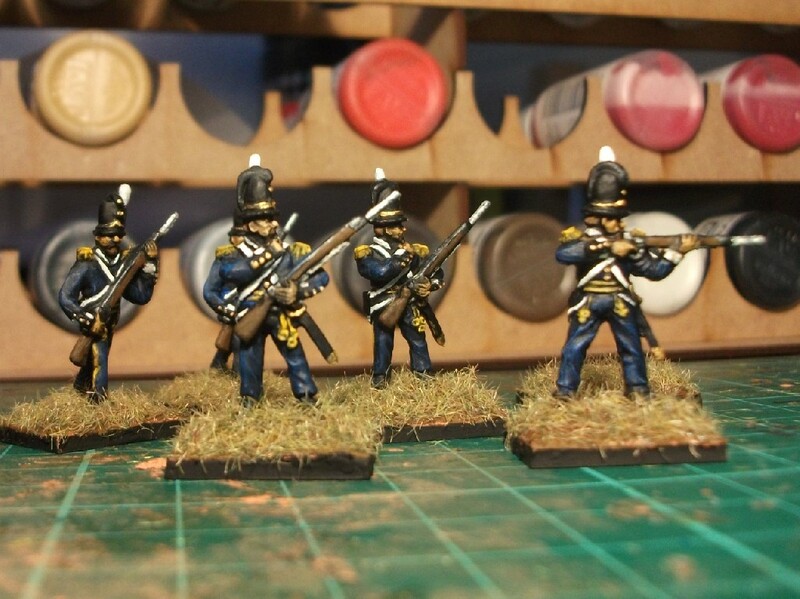 My Sharpshooter officers are both currently still standing in a blob of Blu Tack, patiently awaiting smart basing of the type that their fellow sharpshooter received a week ago. 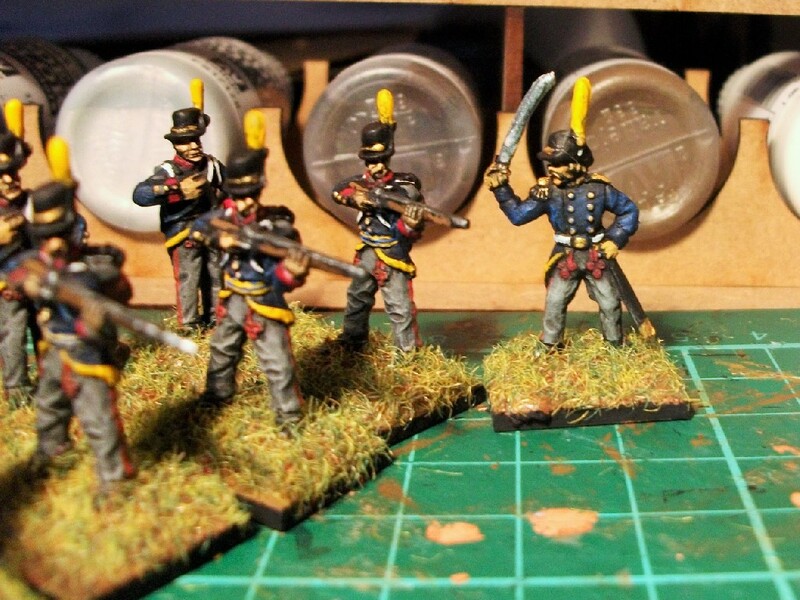 The final based and labelled figures, hopefully even with swords to lean upon, will be presented in a future post! 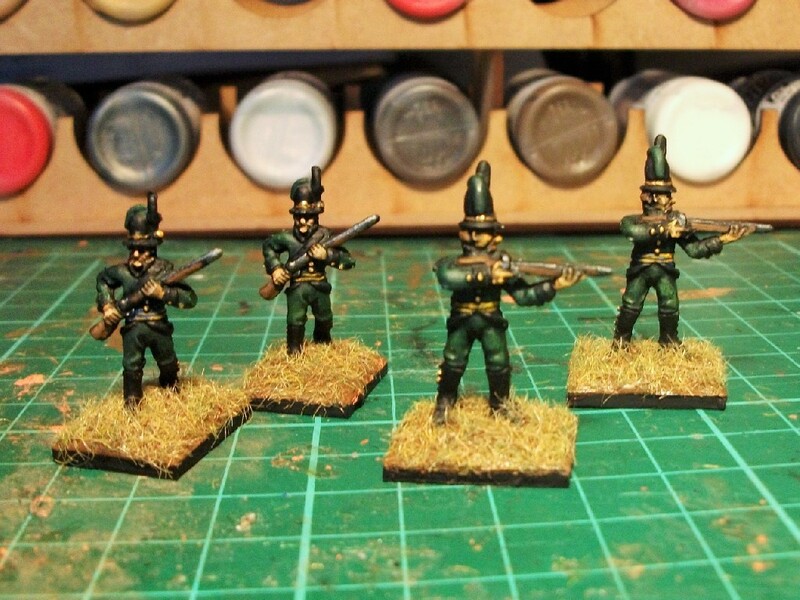 Officers seated on the front rank wearing the green uniform of my figures. Blu Tack is a poor way to present one of R.J. Marrion’s finest yeomen. But until now, Blu Tack is all I’ve had to keep him standing upright. I’ve previously recounted as to the long history of this trumpeter figure. Having been lost for so many years – and then foolishly mislaid again for a couple more – once he did finally return, I had to admit to him that I’d in fact given up all hope and thrown away his original wooden base. He was naturally outraged at my lack of faith. 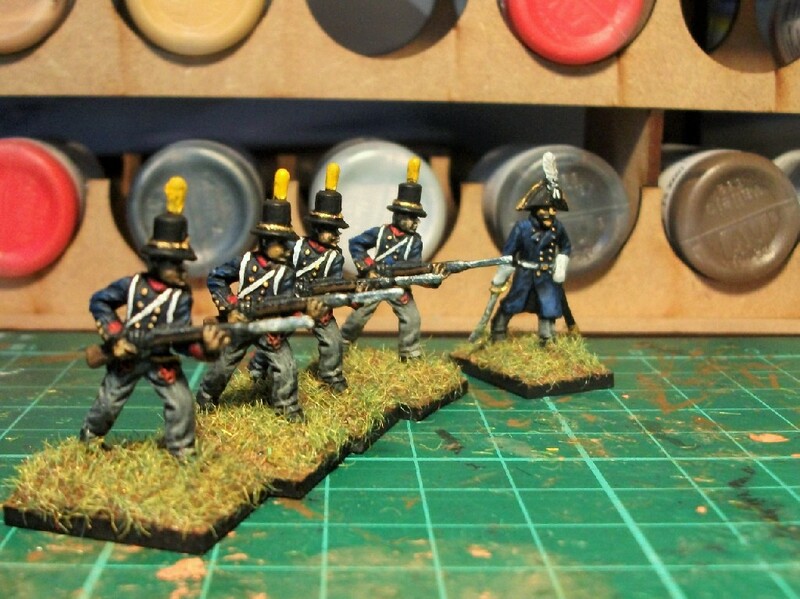 And so, by way of apology, I’ve sourced something altogether more respectable for my straying Sharpshooter. I like to think that it presents my humble tribute to artist Robert Marrion in a far more suitable manner than a blob of Blu Tack. The nicely turned wooden base is made of unvarnished alder wood from a purveyor in eastern Europe (on collection, my local Post Office teller gave my poor wife quite a grilling, not many Ukrainian stamps pass through these parts and what’s more you can’t be too careful what with that poisoning in Salisbury…). I did think about varnishing the base, or maybe adding some kind of colour to it but in the end I decided I liked the natural look best of all. No frills, just the figure. The engraving was very cheaply sourced online and labels the figure nicely, I think. 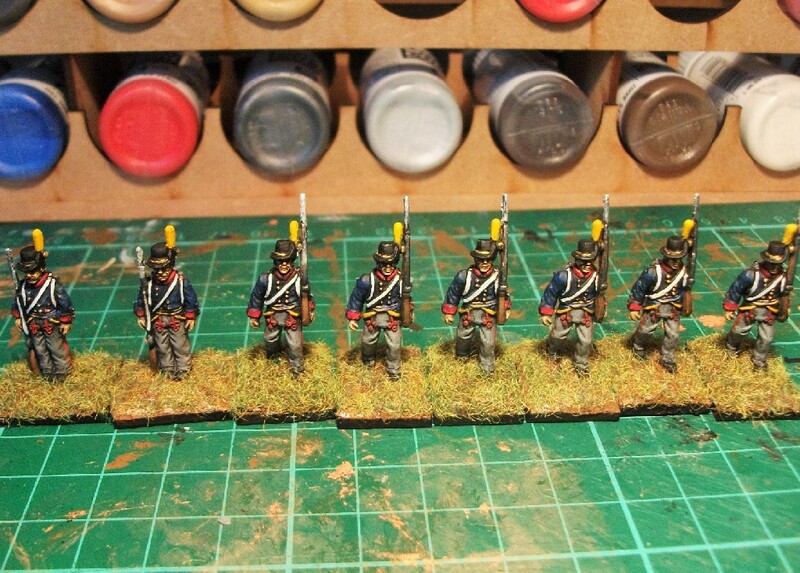 I’ve abbreviated the lengthy regimental title to 3rd CLY (Sharpshooters). On the rear of the figure there is another plaque detailing rank and date. So, here’s presenting the first of my series of ‘Marrion’s Men’; a trumpeter of the 3rd County of London Yeomanry (Sharpshooters). In Drill Order, he dates from the early 20th century, just after the conclusion of the Anglo-Boer War, a conflict which inspired the formation of his regiment. 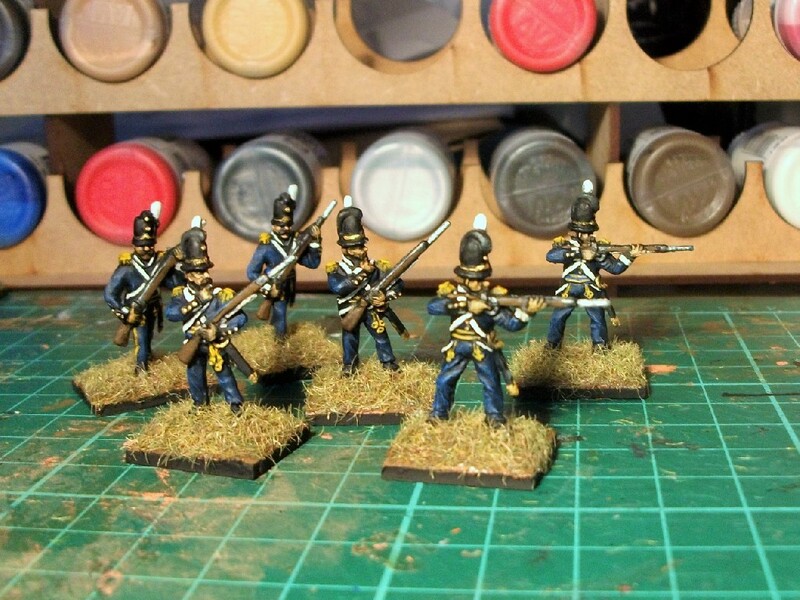 Satisfied with my new base, I’ve ordered some more and (presuming it’s arrival doesn’t send the post office staff rushing for the phone to call MI5), I should soon be in a position to present my next in my series of Marrion’s Men – the already 99% finished sergeant from the Sussex Imperial Yeomanry! In keeping with Mr Marrion’s original illustration, I’ve used similar, though different, base colours for the tunic (Vallejo English Uniform Brown) and the cord breeches (Vallejo Khaki). I mixed my own colour for the Stohwasser gaiters using Red Leather and Burnt Umber. For the green facings, I used Vallejo Black Green and for the trumpet cord / aiguillettes I used Vallejo’s warmer shade of Deep Green. Getting the three yellow stripes that appear on the folds of the Pagri was tricky as the definition on the metal was vague, so I simply did my best. Note the green stripe running down his breeches. So, as I indicated in the last post, he’s now just awaiting his fancy wooden base to arrive. More on that another time, but I do promise that’s it on my Sharpshooter for now! About two years ago, my parents handed me a small metal figure in a little plastic bag which they had discovered deep in their loft. 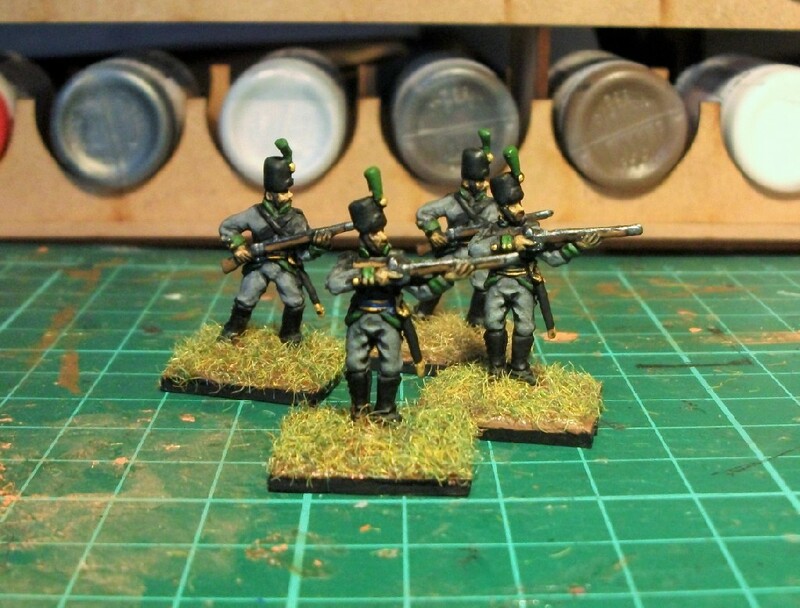 Knowing that it was probably one of my old model figures from my childhood, and furthermore well aware that I’m always painting soldiers nowadays, they brought it over. It was a 54mm figure from Dorset (Metal Model) Soldiers Ltd, which I presume is the same company still going today but under the name The Dorset Model Soldier Company. I guess I must have purchased it from a Victorian Military Society fair in the mid 1980s. The bag also contained a square wooden plinth and a little green baize to mount it on. The figure was from a series called “Armies of the World” and represented a Trumpeter in Drill Order from the 3rd County of London Yeomanry (Sharpshooters) during the period 1902-1907. Men of the 3rd County of London (Sharpshooters), c.1902. 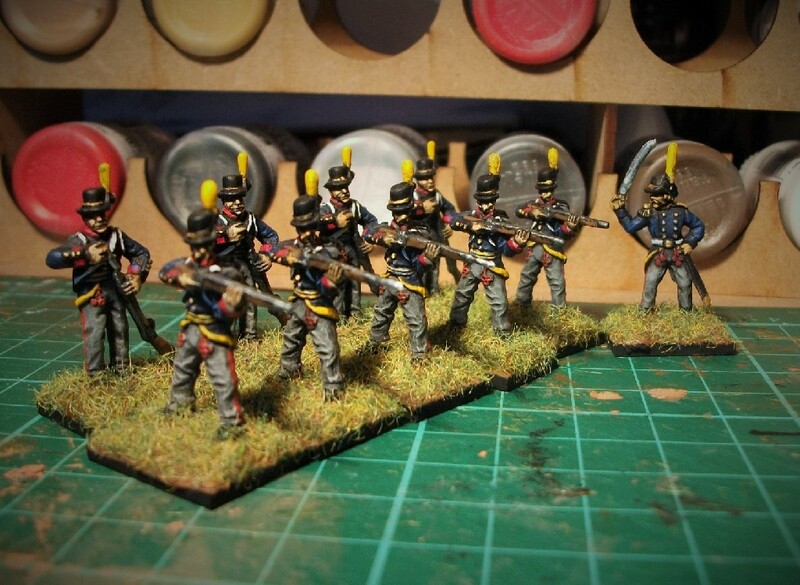 Note the Trumpeter in Drill Order, far right – that’s the very man who literally inspired my figure! I was particularly pleased to rediscover this figure as Yeomanry is a great interest of mine. Having (naturally…) the entire fifteen books from the terrific Ogilby Trust series; “The Uniforms of the British Yeomanry Force 1794-1914″, I pulled out my copy of the 5th book in the series on said regiment to do some research. There on the cover was the very figure I was researching – and, what’s more, in exactly the same pose! I guessed that the sculptor must have used the excellent Robert J. Marrion image on the far right of the cover as a guide, such is the similarity. Furthermore, the illustration in kind must have been based upon the trumpeter seen in the above photograph. 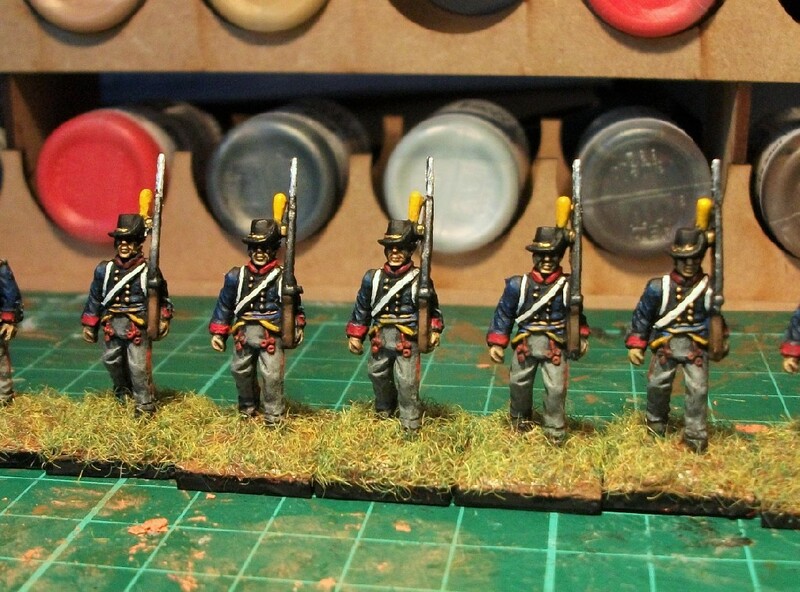 Finally, the figure came with a hand-written painting guide which, confirming the inspiration behind it, indeed recommended that for further details and colours I should see “No.5 in the series “The Uniforms of the British Yeomanry Force 1794-1914”. “C Squadron riding out in Field Service Dress at Bisley Camp in 1904.” The mounted Trumpeter (centre) is sounding a call. …Until I discovered it yesterday! It turned up secreted at the bottom of a magazine rack. Heaven knows how or why it got there, and how it evaded my searches for so long. Now it has returned, I’m tempted to finally have a go at painting it. Heaven knows, I’ve got enough on at the moment, so it may be a little while yet before I make a start. Trouble is, not only have I already clumsily broken the plume off (hastily re-glued), but I am now unable to locate the wooden plinth which ironically has possibly been thrown out after the figure was given up as lost. Never mind; I’ll fashion a replacement! I now want to end by saying some words about R.J. Marrion, the artist who inspired the Trumpeter figure and illustrated for the entire British Yeomanry Force series. Bob Marrion was a former police officer, firstly a dog handler and then latterly, after injury, a police draftsman. He illustrated dozens of books and articles on the subject of military uniforms including the entire Ogilby Trust series on the British Yeomanry Force. Sadly Bob Marrion passed away in 2015 to the great regret of many with an interest in and appreciation for military history, uniforms and artworks. Tantalisingly, from this forum it is suggested that in the 1970s Bob Marrion even sculpted, or at least designed, his own Victorian-era figures under the name Olive Figures. Something to look out for, perhaps? So painting this figure becomes, perhaps, a kind of belated personal tribute to the late Bob Marrion and his essential contribution to the hobby. What more appropriate way for me to do this than bringing to life a sculpted manifestation of one of his illustrations? 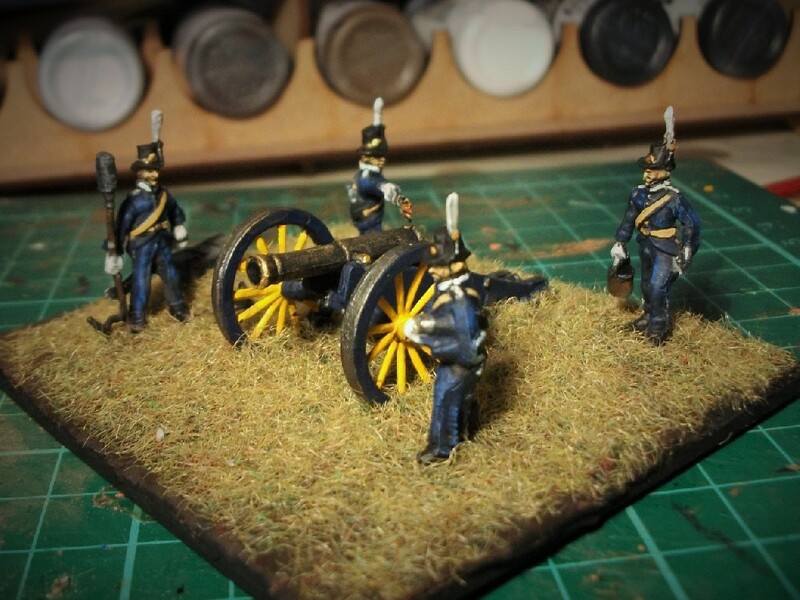 Having not painted anything greater than 28mm, 54mm scale is something very different and so should be an interesting challenge. 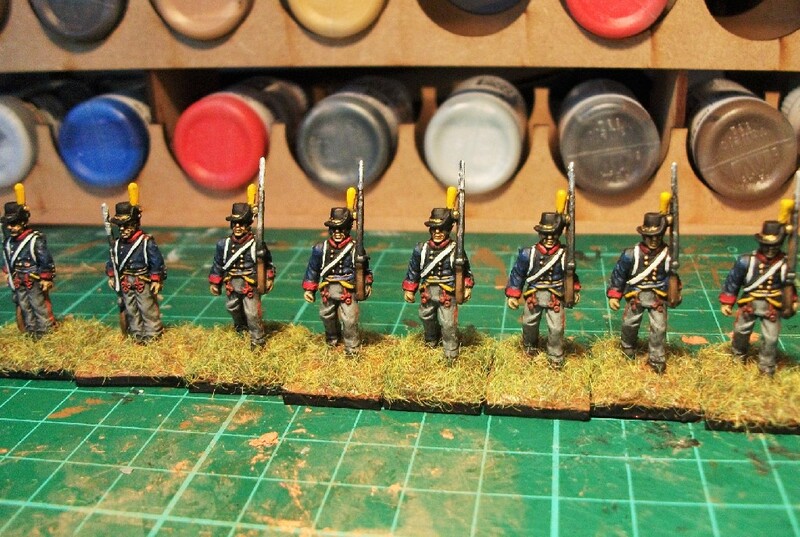 Currently, I’m still finishing off the Zvezda Saxon Cuirassiers, which should be definitely finished some time this week, I reckon. After that, following what has been over 3 decades of being lost and found, I’d say it’s about time this lost sharpshooter – one of Bob Marrion’s artistic visions – was finally brought to life!